What, you say you’ve never seen a tuition coupon? Just because nobody has ever actually held one in her hands doesn’t mean it doesn’t exist. You know how you start getting coupons for movers and home stores when you change your address? Or after you visit a website online, you start getting discount offers from them in your Facebook feed? Well, it’s possible to get a coupon for $10,000 or $15,000 off your college tuition if you pick the right college. The colleges don’t call it a tuition coupon. They call it merit scholarships. Actually, that’s the label they use for the public. What they really call it is tuition discounting. They are reducing the amount of tuition they charge to attract students to buy their product. In other words, they are using “merit scholarships” as incentives for students to attend their college. 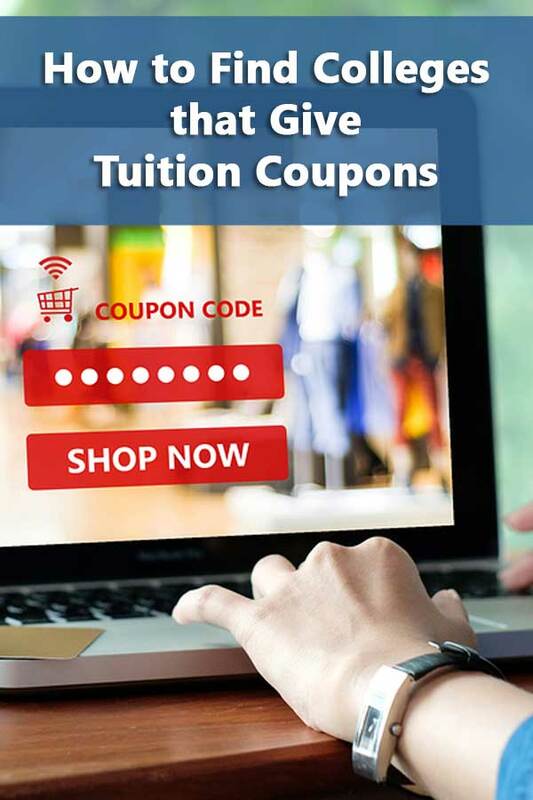 Who qualifies for tuition coupons? Colleges give the biggest value coupons to students with the best academic qualifications. They tend to call these discounts, “Presidential,” “Provost,” or “Chancellor” scholarships. These represent the largest discounts students can receive, with the exception of some athletic scholarships, from the college. They are awarded to students with high qualifications that will help raise the school’s academic reputation. It’s not just in terms of college rankings. These students are more prone to graduate and the name of their alma maters will follow them through their careers and hopefully be associated with their successes. Which colleges provide tuition discounts? So how do you find the colleges most likely to offer you a significant tuition discount? The easiest, most underrated way to do this is by using your test scores. ACT or SAT scores are the easiest way to start your search for college merit money. 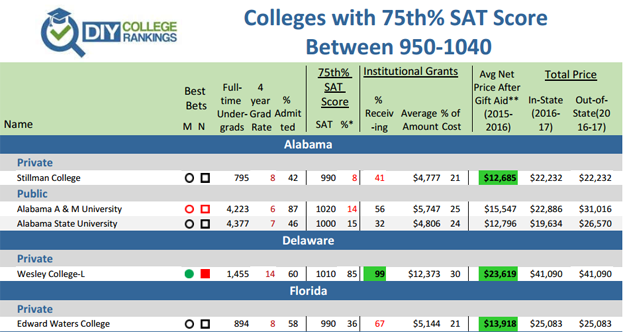 The strategy is simple, find colleges where your test scores are in the top quarter of freshman test scores. Like I said earlier, colleges are more likely to provide tuition discounts to students with academic qualifications that will raise their academic reputation. Now I know students are more than just their test scores and so do colleges. Just because your test score is in the top quarter doesn’t mean that you’ll automatically get a merit coupon. However, it does mean you are more likely to get merit money than at a school where your score is in the bottom 25%. This is far from a perfect system. But if you want a fast, easy way to start looking for merit aid, this is the way to do it. Once you generate a list of schools based on your test scores, you can then start eliminating some by other factors such as location, size, and graduation rates. You’ll be surprised at how quickly you can narrow down your list so that you can start doing some meaningful research on the college and what it offers. For example, if you have an ACT score of 28, there are 283 colleges with 75th% ACT scores between 27 and 29. There are 9 in Illinois, 14 in Florida, and 10 in Massachusetts. Only 131 of the private colleges have a four-year graduation rate of 50% or better. See, it isn’t difficult to reduce the list to a manageable size. Why not just use average GPA? After all, an increasing number of colleges are going test optional and just about everybody has a GPA. There are two problems using GPA. The first is that colleges don’t report the 75th% for GPA. The Common Data Set will list the percentage of students with a GPA over 3.75, between 3.5 and 3,75, etc, and the average GPA for the class. You could make some assumptions and use the average GPA but it’s not as straight forward as just using the 75th% test scores. The second problem is the ability to search on GPA. Since it’s only collected by the Common Data Set, it’s not as readily available as test scores for searching. Go try. You can usually find the GPA on the actual college profile, but it’s not something you easily search on. So that’s why you should use test scores. Obviously, the higher a student’s test scores, the more schools where the student will be in the top 25%. However, you need to understand that as a college’s 75th% score increases, the less likely it is to offer merit aid, even to those in the top 25%. This is because of the nature of merit aid. Remember, merit scholarships are really just a kind of coupon colleges are using to attract students. And colleges that have so many qualified applicants that they turn away the vast majority of them, don’t have to offer tuition coupons to get students to attend. These colleges reserve their coupons for students with financial need. Therefore, when you start looking at schools with high 75th% scores, you also need to start considering acceptance rates. Colleges with lower acceptance rates may do a good job of meeting financial need but don’t hand out a lot of coupons just for merit. This is why you also need to check the percentage of freshman receiving institutional grants. If the percentage is less than 60% for private schools, the school is probably only providing coupons to meet financial need. Now, after that last bit, I’ll bet some of you are thinking this isn’t really as simple as she said. I’ve talked about more than just test scores. I mentioned using size, location, and graduation rates as a way to refine your list. And I’ve just brought up acceptance rates and institutional grants. All true. And there’s even more. Once you narrow your list, you’ll really need to use the school’s Net Price Calculator to see what your actual chances are of qualifying for merit aid. Then you need to research the school to see if it meets your academic needs. But it’s really not that bad. I’ve pulled all of the information into a college list you can download as a PDF document for $9.99. You just have to select the list based on the test scores. There’s a sample below. Of course, you’re welcomed to go look up the information yourself using everything I just taught you–to save $9.99. It’s ok. I don’t mind. I believe that the more people willing to attend bargain colleges but still receive a quality education, the better off financially we’ll all be. But please, at the very least, take the time to share the page with friends and family to show your appreciation. Thanks.